If your garden is overflowing with zucchini, then you and I need to talk zucchini recipes! Last year, we didn’t plant a garden. This year, we did and my husband (bless his heart) decided to make up for it by planting not one but two zucchini plants. You Midwesteners and fellow gardeners know where this is heading. This year, we have zucchini every time we turn around! Right now, I have another 8 zucchini sitting on my counter. We’ve been making zucchini scones, zucchini rice, sauteed zucchini, baked zucchini parmesan wedges and of course, lots and lots of zucchini bread. Zucchini bread is one of those classic recipes that every cook needs in her recipe file. The beauty of a good zucchini bread recipe is that you really don’t taste the zucchini, but you end up with a deliciously moist bread. It’s also a great way to use up your bounty of zucchini! I’ve already baked 10 loaves of zucchini bread (and counting) and the zucchini isn’t showing signs of slowing yet! 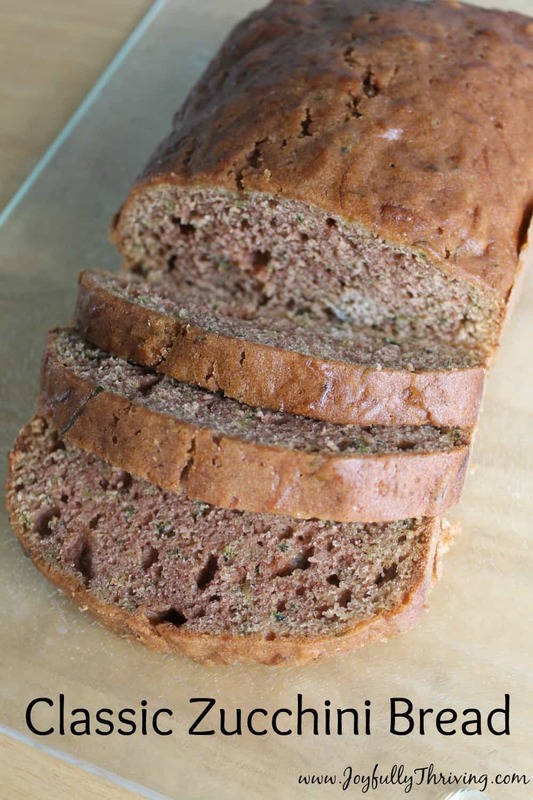 This zucchini bread recipe is a tried and true delicious one. Apparently, my mother and mother-in-law used almost exactly the same recipe. I tweaked it ever so slightly so here is my recipe for zucchini bread. Preheat oven to 350 degrees. Grease and flour two bread pans. In a large bowl, mix together eggs and sugar. Stir in shredded zucchini. Add vanilla, baking soda, baking powder and cinnamon. Stir until combined. Add 1 cup of flour at a time, stirring until flour is completely mixed in. Repeat until 3 cups of flour have all been mixed in. Pour batter into greased and floured bread pans. Bake at 350 degrees for 45 to 60 minutes. This bread freezes great! You can also grate 2 cups of zucchini and freeze it in bags to make zucchini bread later. That is a great way to enjoy zucchini bread in the middle of winter. This classic zucchini bread is a tried and true recipe that always tastes good. It's an delicious way to use up all the zucchini from your garden! We marinade the zucchini in olive oil, balsamic vinegar, sea salt and pepper and grill these with peppers and onions! Delicious! We even reheat them on the stove and they are doubly good! Enjoy zucchini season! This recipe had a wonderful flavor to it, but my bread turned out very dense and dry. I may try this again and add some milk to it. Hmm. Maybe try shortening your baking time? I wonder if your oven bakes hotter than mine does? I baked it was 50 minutes.